Tissues are inherently three dimensional in nature, which makes imaging intact tissues a necessity for a more complete study in the relationship between structure and function and the system-level study of cellular mechanisms. Tissue clearing has become an important step for imaging tissues in 3D at single-cell resolution. The X-CLARITY™ is a collection of systems and ready-to-use reagents to standardize, simplify, and accelerate each step of the tissue clearing process. X-CLARITY™ is based on CLARITY (Clear Lipid-exchanged Acrylamide-hybridized Rigid Imaging / Immunostaining /in situ-hybridization-compatible Tissue hYdrogel), a tissue clearing method developed by the Deisseroth lab at Stanford. With CLARITY, preserved tissues are embedded in a hydrogel matrix and lipids are actively extracted through electrophoresis to create a stable and optically transparent tissue-hydrogel hybrid that is chemically accessible for multiple rounds of antibody labeling and imaging. Native cytoarchitecture remains intact and even endogenous fluorescence proteins are preserved for robust fluorescence imaging downstream. The new X-CLARITY II Tissue Clearing System from the imaging specialists at Logos Biosystems provides an all-in-one solution for electrophoretic tissue clearing. The groundbreaking CLARITY™ method developed by the Deisseroth Lab at Stanford University (Chung et al, Nature 497:332-337) provides unparalleled tissue samples for imaging. Combining an innovative electrode design and an integrated cooling system, the X-CLARITY™ Tissue Clearing System allows for faster and more consistent tissue clearing. Many researchers currently attempting the CLARITY™ method often encounter difficulties that range from instrument construction to poor clarifying, resulting in the loss of valuable samples. Days or even weeks spent processing a precious sample can end in frustration and disappointment. The X-CLARITY™ Tissue Clearing System greatly simplifies the CLARITY™ process, can clarify a whole adult mouse brain in under 48 hours, and dramatically increases your chances of obtaining transparent tissue samples for use in downstream labeling. Typical negative effects related with conventional electrophoretic tissue clearing methods include burning, melting, the formation of black precipitates, and bubble trapping. The main causes of these artifacts are due to irregular electric currents and poor temperature control during electrophoresis. The X-CLARITY™ dramatically reduces the negative effects associated with standard electrophoretic tissue clearing with a unique electrode design and an active cooling system. 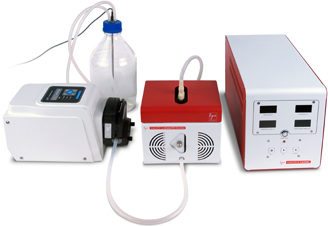 The X-CLARITY™ Tissue Clearing System is composed of four components: 1) the X-CLARITY™ ETC Controller, 2) X-CLARITY™ ETC Chamber 3) X-CLARITY™ pump and 4) X-CLARITY™ buffer reservoir. 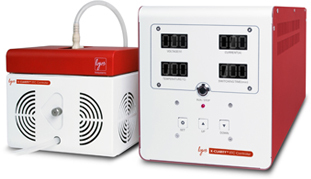 The X-CLARITY™ ETC Controller works as both a power supply and temperature controller. 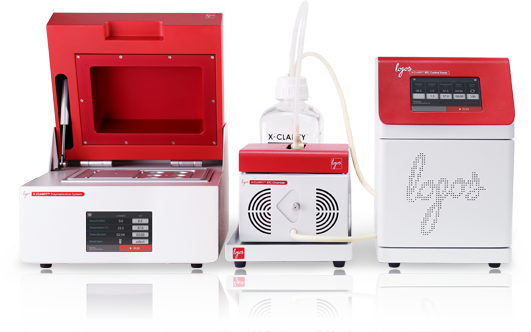 At the heart of the X-CLARITY™ Tissue Clearing System is the X-CLARITY™ ETC Chamber. A tissue sample is placed inside the X-CLARITY™ ETC Chamber where it undergoes electrophoresis to remove lipids. Clearing buffer is continually circulated through the chamber under temperature controlled conditions, minimizing the probability of artifacts arising due to poor temperature control. Compared to other methods, the X-CLARITY™ Tissue Clearing System dramatically reduces tissue clearing time. A whole adult mouse brain can be cleared in under 48 hours. Depending on the thickness, mouse brain slices may be cleared much faster. Additionally, the speed of the X-CLARITY™ Tissue Clearing System makes optimizing for other organs and tissues a much easier endeavor. One of the most exciting features of the CLARITY™ technology is that, it allows for the penetration of and labeling with macromolecules such as antibodies or oligonucleotides, generating unprecedented 3D images that show the relationship between structure and function. Chemical tissue clearing technologies introduced in recent years generally do not accommodate labeling with macromolecules. CLARITY™ overcomes this limitation and even enables multiple rounds of antibody labeling. The X-CLARITY™ Tissue Clearing System also successfully produces samples that demonstrate the efficient penetration of antibodies. CLARITY™ is a novel technology that produces a transparent tissues by forming a hydrogel network that supports the ultrastructure while allowing for the removal of lipids. Unlike other tissue clearing methods, the CLARITY™ uniquely enables the efficient labeling of tissues with macromolecules such as antibodies and nucleic acids, making high resolution imaging possible. CLARITY™ is expected to overcome the current limitation of light microscopy technology, which does not allow the imaging of tissues without first creating slices. CLARITY™ is the trademark of Stanford University.